Arguably the best designed off-road vehicle made to date, the Jeep Wrangler has endured for over half a century. 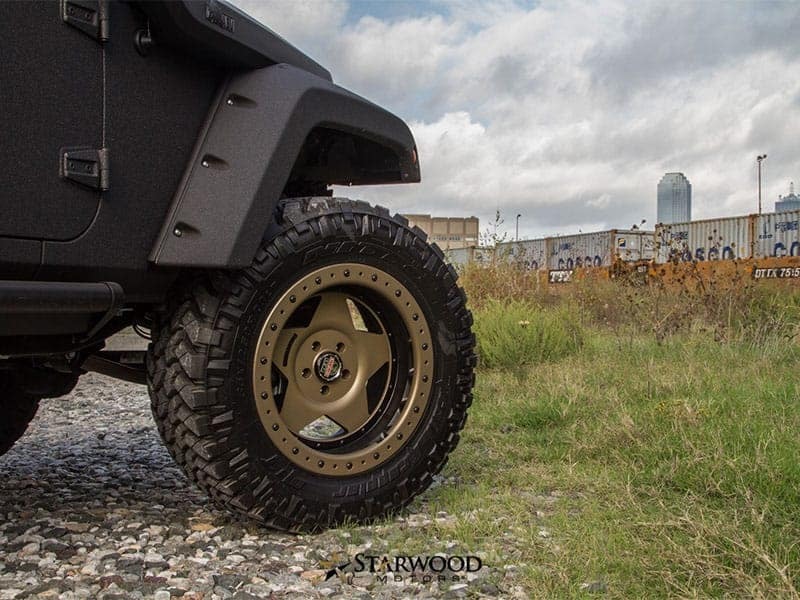 Starwood Motors loves the Wrangler so much that we have devoted much of our heart and soul into creating custom versions that are as much trail kings as they are show stoppers. Then comes the Bandit Conversion. The conversion extends the frame both in front and behind the rear axle. Custom drive shafts, brake lines, and wiring harness extensions are installed. Finally the frame is reinforced for ride and handling. When it comes to off-road versatility, the Jeep Wrangler is the first SUV that many drivers think of. 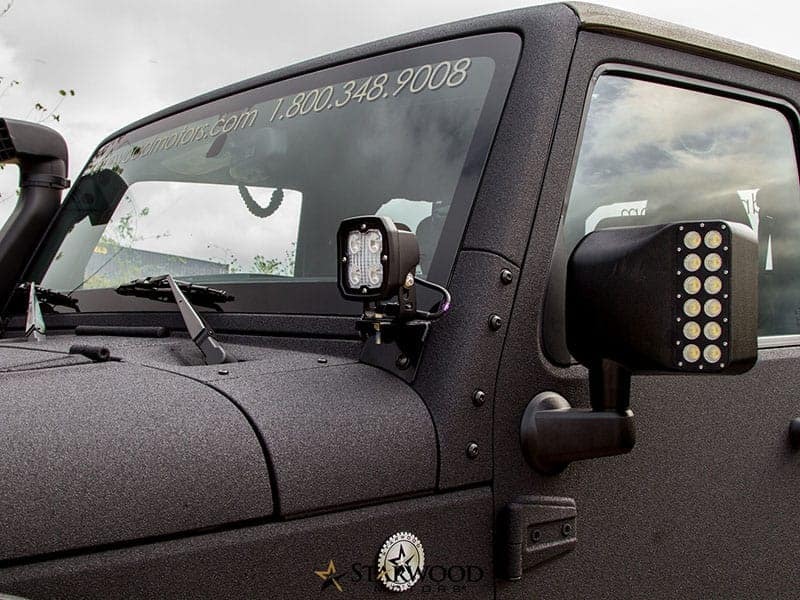 Enduring for over half a century, the Wrangler is near and dear to us at Starwood Motors. We’ve spent countless hours crafting custom Wranglers that dominate the trail and turn heads just about anywhere. 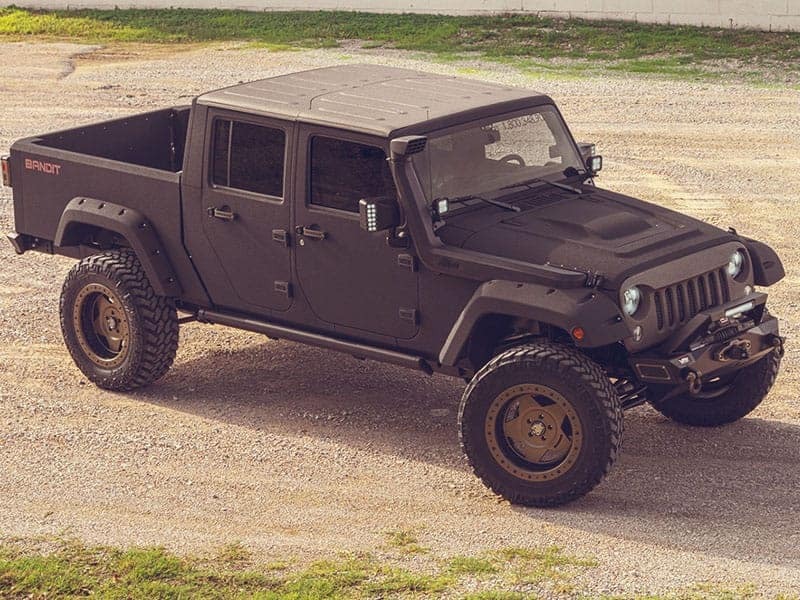 For even more capability and style that’s impossible to ignore, though, there’s the Jeep Bandit truck at our Dallas custom shop. So, what makes this conversion so exceptional? Everything! We start at the very core of the Wrangler, extending the frame on both sides of the rear axle. 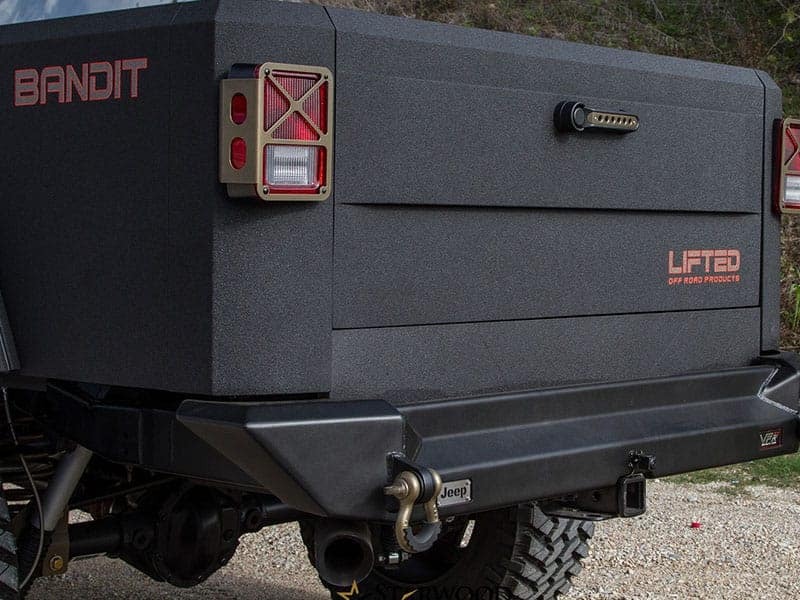 We then put that extended wheelbase to work, adding unique bumpers and fenders, as well as a custom sheet metal truck bed with storage pockets and tie downs for unbridled functionality. The result is an unmistakable custom vehicle exterior that Fort Worth area drivers can’t help but love. Of course, we also reinforce the frame and install custom drive shafts, brake lines, and wiring harnesses for the performance and reliability that you love. 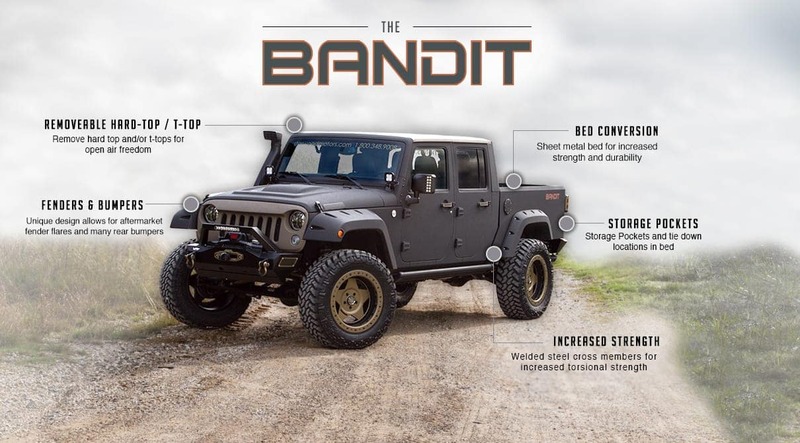 All told, the Bandit conversion completely reinvents the Wrangler as a five-seater truck that’s ready for anything! 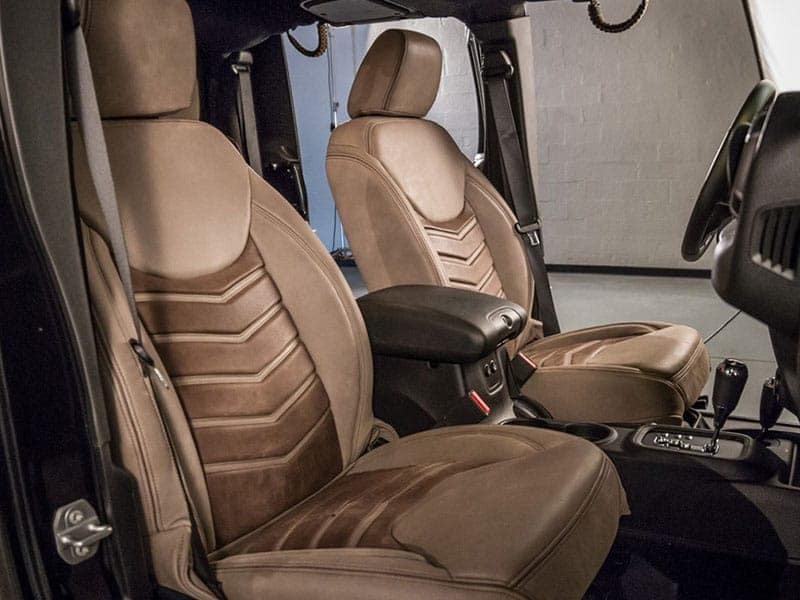 Already daydreaming about sliding behind the wheel of the Jeep Wrangler Bandit truck? 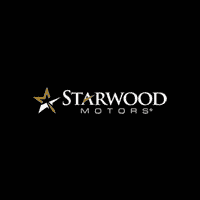 Don’t hesitate to contact Starwood Motors online or to call our staff at 214-367-5400 today to get the ball rolling!